Class Insecta, order Lepidoptera, family Arctiidae, genus Hyphantria. It is a polyphagous pest of fruit crops. 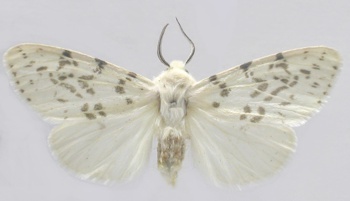 Moth is snow-white, rarely with black or brown spots on wings; short antennae black with white pollination, pectinate in male edge, threadlike in female. Abdomen covered with white fluff, greenish in virgin females. Wingspan is 25-35 mm; body length 10-16 mm. Eggs are green (0.5-0.55 mm in diameter), becoming dirty-gray during embryonic development. Female lays eggs in groups of 100-600 (maximum 2000) in a batch, on lower side of leaf, covering them with white abdominal hairs. Young caterpillars are green, covered with tubercles, setae, and hairs. Length of mature caterpillars reaches 25-35 mm. Their dorsum is velvety-brown, lateral sides with citreous stripe that is densely covered with long setae and hairs. Pupa brown, with 10-15 blunt setae at end, with cremaster; pupa length is 8-15 mm; it is situated in a gray friable cocoon. The pupa winters under bark of trees, in dry leaves, residues on the ground, cracks of fences and buildings. Moth flight begins before the beginning, or during, the flowering of apple. After pairing females lay eggs. After 10-14 days caterpillars hatch, passing through 7 (6-8) instars. Caterpillars of first four instars live in colonies in nests of shoots and leaves plaited by a web. Then the caterpillars creep away, leaving tree in the seventh instar and creeping to different secluded places, where they pupate. The pest was introduced into West Europe in 1939-1940 from North America. First centers in the Ukraine (Transcarpathia) were found in 1952. Now H. cunea has occupied Russia (the south of the European part), Ukraine, Moldova, Georgia, Azerbaijan, Uzbekistan (Urganch); southern and central Europe, Turkey, China, Korea, Mongolia, Japan; it has been found in Lithuania (single instance); the pest also inhabits the USA, Canada, Mexico, and Columbia. This species is bivoltine in the Ukraine and southern Russia; sometimes a 3rd incomplete generation is observed. Moth flight begins in spring at degree days 100-130° (above 9°C). Hatching of caterpillars is observed from the end of May. Moths of 2nd generation fly from the middle of July until the end of August. Caterpillars develop in August-September. Mass pupation occurs in October (in Transcarpathia at degree days 1287°). Duration of diapause is 7-9 months. Development of all stages depends strongly on temperature and relative air humidity, and also on the pest population density and host plant species. Optimum conditions for caterpillar development are temperatures of 24-27°C and air humidity of 75-85%. The species spreads by natural migration of moths, but mainly by transportation of fruits from infected areas. The pest causes damage to mulberry, apple, plum, sweet cherry, Circassian walnut, pear, quince, apricot, peach, bird cherry, dogrose (up to 230 species of tree, bush, and grass plants). The insect is capable of completely destroying leaves on trees. Because of its polyphagia, high fertility, plasticity, and presence of two generations the species is rather damaging and quarantine actions are needed. The examination of cargoes and vehicles that carry imports from the countries of pest distribution and the disinfection of vehicles and industrial cargoes are necessary. If the complex of actions is not carried out or is spent without due results, then export of fruits from the infected areas is prohibited. Agronomic control measures include the cutting of web nests with caterpillars, cleaning of fruiters from peeled bark, removal and burning of vegetation residues in autumn and winter for liquidation of pupae. Chemical measures include insecticide spraying of infected trees, bushes, and all vegetation in a 50 m radius from the infected plants. It is necessary to treat all susceptible tree species growing along highways and railways, in forest belts and young gardens at the beginning of caterpillars. appearance. Biological methods include the use of bacterial and viral preparations that cause the disease and death of caterpillars. Monitoring is possible with the use of light and pheromone traps. © Grichanov I.Ya., Ovsyannikova E.I.